Accolade Wines have launched a new £1m campaign by Creature to promote its Kumala wine range, bringing to life the rich South African heritage of the brand. It’s the first new creative campaign the brand has undertaken since the arrival of David White as Accolade Wines Marketing Director earlier this year, and is the company’s biggest investment in the brand for 10 years. 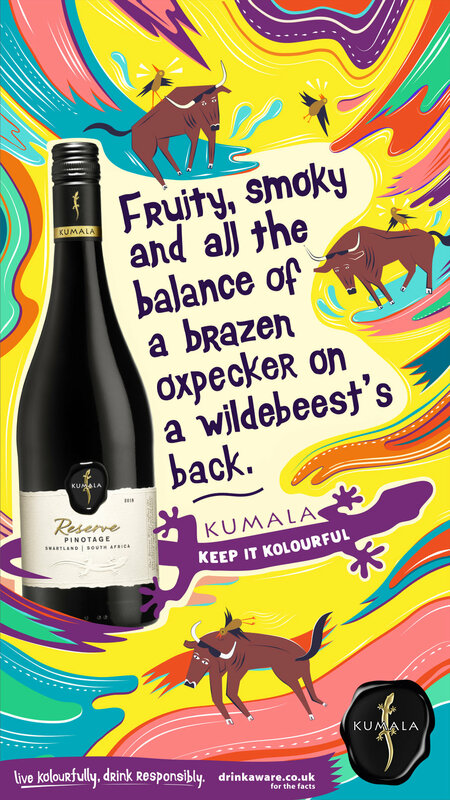 The creative brings to life the story of Kumala, showcasing South African spirit through the wine’s tasting notes in a visual campaign that uses vibrant colours and creatures bursting with character. South African Artist Maaike Bakker created the illustrations. The end line ‘Keep it Kolourful’ is a call to action that breaks Kumala out of the sometimes stuffy and staid world that wine advertising tends to play in, setting it apart from its competitors.